Are You Going to Heaven tracts : Share the Good News with colourful tracts. Size 3 1/2" x 5 3/8". Package of 25. Share the Good News with colorful seasonal tracts. Size 3 1/2" x 5 3/8". Package of 25. Features a check list to find out if, according to God's Word, you're on the way to Heaven. Are You Going To Heaven Tracts Pack of 25 by William MacDonald was published by Crossway in April 2012 and is our 2832nd best seller. The ISBN for Are You Going To Heaven Tracts Pack of 25 is 9781682160121. Be the first to review Are You Going To Heaven Tracts Pack of 25! Got a question? No problem! 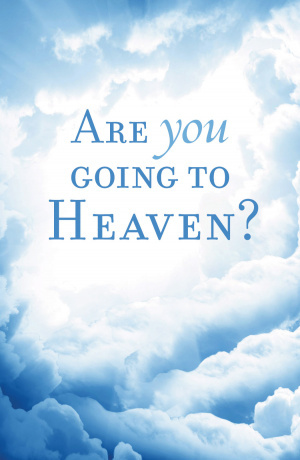 Just click here to ask us about Are You Going To Heaven Tracts Pack of 25. "We are all as an unclean thing, and all our righteousnesses are as filthy rags" (Isaiah 64:6). 12 or 13-Without trusting in Jesus Christ, baptism and Communion cannot help. The Bible shows clearly that these are of spiritual value only when one believes in Jesus Christ. See Acts 8:12; 1 Corinthians 11:2, 23-32. 14-Children born into Christian homes need to be saved just like anyone else. "As many as received Him [Christ], to them gave He power to become the sons of God, even to them that believe on His Name: which were born, not of blood [not of one's parentage], nor of the will of the flesh, nor the will of man, but of God" (John 1:12-13). 15, 16, and 17-Neither Confirmation, penances, or extreme unction are the basis for going to Heaven. God has provided only one way of salvation. So what is God's only way of salvation? The Bible gives a definite answer. The one and only means of spending eternity with God in heaven is faith in the Lord Jesus Christ alone. Because we cannot save ourselves by good works, good character, personal effort, or merit of any kind, God sent His Son to die as a substitute for sinners like you and me. When the Lord Jesus died on the cross and rose again on the third day, He finished the work necessary for salvation. Now all God requires of you is to receive Christ as your Lord and Savior: "Believe on the Lord Jesus Christ, and thou shalt be saved" (Acts 16:31). So when you trust in Jesus you are saved and are destined to spend eternity in Heaven. Jesus said, "He that heareth My word, and believeth on Him that sent Me, hath everlasting life, and shall not come into condemnation; but is passed from death unto life" (John 5:24). Will you accept God's way of salvation? The choice is yours. You may continue to trust in those things listed on page 2. If so, you will go to the grave without Christ and wake up facing God's eternal punishment. Or, you can believe in Jesus Christ and be saved. Be wise! Choose Christ! Then indicate the choice you have made below. __ My only hope for Heaven is based completely upon the finished work of Jesus Christ on the cross. I now accept Him as my personal Lord and Savior. Re: 'Are You Going to Heaven' (tract) Is the author William MacDonald or this a different publication?